The forming of the Dadu Tableland and Pakua Tableland created the Taichung Basin during the Pleistocene Era. The site was formed by scouring of the Dadu River that created an alluvial plain with fertile lands in Taichung. The Aboriginal people (The Plain Group) used this fertile land for agricultural use. After the Qing dynasty lost the First Sino-Japanese War to Japan , China ceded the Taiwan Province in the Treaty of Shimonoseki. The site was taken as a Japanese military airport during occupation in 1922. In 1945, after the defeat of the Japanese Empire in World War II, Taiwan took back the site and used it as a military base. Moreover, the site was the most important part of Taiwanâ&#x20AC;&#x2122;s aviation and the airport relocation policy was made in accordance with the Central International Airport Policy. Taichung Airport was relocated to CCK International Airport. Ownership of the land was transferred to the National Property Bureau and is now partially managed by Taichung City Government, which is planning to create a grand park in Taichung City. • Taichung Airport used to be the only place where Taiwan produced and tested planes. • It was the first civil airport in Taichung City. • Taichung City wants to become a municipality and the city expected the Taichung Airport to become an International Airport. However, the airport is too small to become an international airport. The city decided to move to the new airport, CCK International Airport, 12.4 km away from the site in Taichung. • The airport used to be surrounded by suburbs with farming land around the site. In the recent years, the city expanded quickly and the Taichung Airport is surrounded by buildings and markets today. The law for limiting the building height because of the airport influenced the development of real estate in West Valley and North Valley resulted in low rise buildings surrounding the project site. apartments and condominiums, and light commercial uses. The Cultural District will be much higher in density, featuring more and taller apartments and condominiums on a grid of avenues. The plan is intended to engender a lively atmosphere conducive to art galleries and creative living. The Academic District will build on the proximity of Taichungâ&#x20AC;&#x2122;s Feng Chia University to explore creative energy in a different context. Middensity zoning will accommodate student facilities and amenities. Prospect Park, and similar grand parks in cities across America and Canada. Those large parks provide people who live in the city recreation, inspiration, and escape from the city’s blare and bustle. The large parks give people the chance to enjoy and experience nature in cities without going to the countryside. Today, the third biggest city in Taiwan, Taichung, has a 613 acre airport, which has been abandoned. Besides the abandoned airfield, there is also a former army base connected to the site, as well as agricultural land that the city has acquired with plans for future development. The site has a great opportunity to be transformed into a grand park similar to New York’s Central Park, San Francisco’s Golden Gate Park, London’s Hyde Park, and Amsterdam’s Bos Park. In the future, Taichung Gateway Park can achieve many benefits for the residents of Taichung. To create a large public park in my city, I want to bring nature into the city. I would like to keep the aviation history in the site, using historical elements to create a park that express the history with natural form. The park will provide a space where people can do physical activities and be exposed to nature and greenery to promote health. The park can use many strategies for environmental benefit including pollution abatement and control of stormwater runoff. It can provide social benefits, give people recreation opportunities, and strengthen the bond of neighborhoods and communities. By providing more green spaces and other amenities, the site will become a destination for residents and visitors from all over Taichung City for many generations. The site is a former airport with a long distinguished aviation history. Taichung Airport closed in 2002 and remained abandoned until 2004 when the Taichung City Government decided to designate the site as a large park for the city. The 613 acres of empty land has the potential to become as important to the city of Taichung as Central Park is to New York City or Bos Park is to Amsterdam. However, the site has many challenges that needs to be solved. The site has always been a barrier between the North Valley and West Valley. The road system doesnâ&#x20AC;&#x2122;t connect to the two regions because of the airport. Moreover, the site has a significant history for Taiwan, but people cannot access the historical elements. 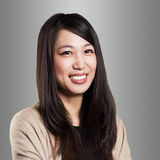 To emphasize the siteâ&#x20AC;&#x2122;s history and create a connection between the two regions will be primary concerns in the design. According to the government proposal, there should be five districts in the site, including an International Cultural District, an Academic Research District, a Waterfront Residential District, a Shopping District and a Taichung Gateway Park. These five districts should be well connected in the site with different programs to serve a variety of purposes for residents and visitors. I have developed a Master Plan for the entire site based on the government guidelines. For my thesis project, I will focus on Taichung Greenway Park. The site history of aviation and airplane production is the inspiration for my concept which is the idea of building the future. I want to create a futuristic site where people can believe that everything is possible and anything can happen. Furthermore, I want to use flow movement as a design principle creating sinuous movement and making the connections on the site. For the future, I hope the Taichung Gateway Park can achieve many benefits for citizens and the city. I hope that people can access the park and recreations facilities to lead more healthy lives, both mentally and physically. The park can provide a more suitable place for people. The green spaces play a key role for preserving water, improving air quality, reducing pollution, protecting wildlife as well as benefit the environment. The park can provide community space for socializing, and give the community a vital identity. It can help to create strong, safe, friendly community. The site is surrounded by two schools and it can provide a chance for communication between students. Moreover, the park can give educational opportunities for people. The park will enhance property values, contribute to healthy and productive work forces and help attract and retain businesses. Those benefits can provide both residents, and visitors a new lifestyle, experiencesâ&#x20AC;&#x201C;all important economic benefits in Taichung City. SCOPE OF RESEARCH Based on the Urban Plan and Regional Plan of Taichung City, Taichung Former Airport is destined to become a large park. It is a valuable land of 613 acres with plenty of resources to draw from. In Taichung City, people don’t have enough green spaces and that’s the reason that the government wants to change the former Taichung Airport into a park. In the government proposal’s guidelines, the government wants to have five districts: International Cultural District, Academic Research District, Waterfront Residential District, Shopping District and Taichung Gateway Park. In the Master Plan of the site, I will incorporate the government guidelines and follow the Master Plan from the government. The Master Plan was developed by New York architect, Stan Allen, and responds well to globalization trends, anticipates growth due to the Taiwan-China Trade, and transforms the city into an international metropolis. 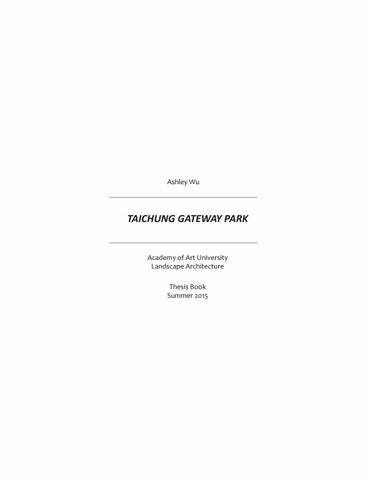 My thesis project will focus on Taichung Gateway Park, which is approximately 170 acres. My plan is not only to build a large park with multiple uses, but also to achieve a sustainable and ecological design. Within the boundaries of the site there are plenty of opportunities, including various historical elements, existing canals, and the surrounding communities. The goal of the design is to connect the resources together into a sequence of spaces serving needed functions for education, recreation, exhibition, entertainment and cultural preservation into a cohesive network. ROLE OF DESIGN The thesis will take the proposal from the government and based on its guidelines, focus on the design of the 170 acre park itself. The research addresses current issues of urbanization and aims to provide possible solutions through design. The research focuses on two primary issues: how to engage with the urban fabric and incorporate its historical identity. The first issue responds to urban water management problem. The thesis does not try to change the entire city infrastructure, but uses landscape design as a solution for mitigating water management problems in the city. The design components seek to present a research of stormwater management through detention, retention, filtration, infiltration, collection, and storage as well as utilize the flow of water to reinforce circulation within the park and its urban context. The second issue researches the proposal from the government and the site history. The thesis does not change the Master Plan, but cooperates with it. The research will find the siteâ&#x20AC;&#x2122;s historical identity and engage with the proposal that the government provided and make the connection with the airportâ&#x20AC;&#x2122;s historical identity . RUNWAY The runway was built during World War II. It has been repaired and enlarged several times. It is the most obvious reminder of the siteâ&#x20AC;&#x2122;s former use as an airport. The blockhouse was built during the Japanese occupation in World War II. The blockhouse served as a defensive storage point against any enemy and it has been left for 70 years as a significant element to represent Japanese military presence in World War II. The Air Base was built when Taiwanese military took over the site of the Air Force Command Center. It used to be Taiwan military command center. The buildings are 60 years old. The Air Traffic Control Tower was built during the Japanese occupation and it has been renovated several times throughout the years. The flight hangar was built when Taiwanese military took over the site. The site used to be an important place for aviation industry and the Flight Hangar used to be the place where planes were manufactured and tested. Military Use – It used to be an airbase for training soldiers and producing airplanes. Industrial Use – Aerospace Industrial Development Corporation which is one of the important aviation industry in Taiwan is in the site. Agricultural Use – It is mainly paddy rice field. Summer is the hottest time in Taichung where the temperature averages 82o-83o Fahrenheit. 0 - 9 YEARS 11 - 19 YEARS 21 - 29 YEARS 31 - 39 YEARS 41 - 49 YEARS 51 - 59 YEARS 61 - 69 YEARS OVER 70 YEARS April to May is the monsoon season in East Asia, however, there are higher levels of precipitation from July to August. April has the least sun exposure coinciding with the monsoon season. October has the most sun exposure. As a former military base and aviation center, heavy metal substances such as copper, lead, and cadmium were used in the manufacturing and maintenance of the airplanes. The report from the Taiwanese Environmental Protection Administration states that high concentrations of heavy metal contamination, which includes capacitor oil, copper, lead, cadmium, and chromium, are found near the Air Base and Flight Hangar. These heavy metal substances may pose an unacceptable risk to human health and the environment if brought to the surface and handled in an uncontrolled manner. THE SOLUTION FROM TAICHUNG CITY According to the report from the Taiwanese Environmental Protection Administration, the site has a 1.9 acre and 16 foot deep area of contaminated soil. The government budget plans to spend $200 million (TWD) to clean and remove the contaminated soil. The government will use a dilution method, chemical neutralization, and solidification for different levels of contamination in soil remediation. THE SOLUTION FOR THE THESIS The thesis proposes a different method than the government to resolve the heavy metal contamination onsite. Instead of removing the contaminated soil from the site in a costly manner, the solution proposed by this thesis utilizes sustainable practices to treat and prevent exposure to heavy metal contamination. First, I shall identify the types of heavy metal contamination and then catalogue which substances are potentially treatable and which are less likely to be treated through phytoremediation. For untreatable contamination, the design uses a landfill cap to contain the pollutants. For treatable contamination, phytoremediation will be used to remove the pollutants. The design aims to achieve sustainability goals that are both ecologically and economically beneficial. According to the American National Standard of Green Spaces, there should be a minimum of five acres of green space per thousand people, which equates to about 20 m2 per person. In San Francisco, there are 7.2 acres of green spaces per thousand, which is 27.5 m2 of green spaces per person. In Taichung City, there is only 5.45 m2 of green space per person. Compared to San Francisco and the American National Standard of Green Spaces, Taichung City does not provide an adequate amount of green space per person. TAICHUNG The temperatures in summer achieve 35 Fo, and usually come with huge rainfall. THE ISSUE OF TAIWAN Taiwan receives 2.6 times more rainfall than the global average – yet it is nevertheless classified by the United Nations as an area of scarce water resources. Despite plenty of rainfall in Taiwan, more than half of rainfall drains to the ocean because of Taiwan’s steep topography. Due to the central mountain range in the middle of the island, water runs to the ocean quickly during storm events. Furthermore, urbanization, channelized rivers, and canals increase the speed of water runoff. Losing of water capacity is one of Taiwan’s major issues. THE ISSUE OF THE SITE The water situation is also a concern on the site itself. There are two channelized canals that run through the site. One of the channelized canals has a large catchment area of 5,800 acres that is prone to flooding during storm events (occurs offsite). This thesis responds to the important water issue of Taiwan to grow its water capacity and collect rainwater. Moreover, the design seeks to protect the channelized canal from the flooding issue of storm surges and reduce stormwater load on the sewage system. The methods of stormwater management in the thesis try to minimize the risk and maximize the possibility of water management. INTRODUCTION Aqua-cultures is an innovative park model that integrates recreation, culture, water treatment, and biodiversity. Aqua Cultures is a living filter for water and air that catalyzes a robust range of urban programs. Recreational and cultural activities occur within, atop, and beside the pools of water -- floating lanterns flickering in the night, kayaking and canoeing on warm summer afternoons, children laughing as they watch for fish in the dense reeds, and secluded moments of quiet reflection next to the gurgling waters. Runways to Greenways, an urban design proposal for the Vatnsmýri area of Reykjavík, seeks to simultaneously acknowledge the rich history of the site while looking forward to new economies and public realms. The area under consideration is a defunct World War II runway, established by the Americans. The area, significant in size relative to the historic area of Reykjavik, is slated for universities, biotech development, housing and commercial. FORMER STRUCTURE HISTORICAL ELEMENTS This inspiration came from aviation. The site was an airfield, and there are great elements, such as a runway, flight hangar, and airplanes. These elements inspire the design from the form of the landing strip and the structure of the flight hangar. CANALS AND FARMLAND FLOW OF WATER This inspiration came from the surrounding condition of the site. The lands around the site were for farming. The farmlands are rectangular with canals and ditches passing through the farmland. The geometrical shape with canalâ&#x20AC;&#x2122;s carved movement becomes a beautiful landscape. CONCEPT AND IDEA Taichung Gateway Park integrates surrounding resources and historical elements, and creates a flow system for movement. A new vision moves from city to nature, history to future, and ground to sky. FLOW SYSTEM The idea of a flow system symbolizes breaking down the boundary between the former airfield and Taichung City and turns the park into a bridge that connects hydrology, ecology, and circulation. The flow system not only resolves the hydrological and disconnection issues, but also brings activities and recreations into the park. The flow system dissolves the barrier between the former airport and the city and creates a harmonious flow system integrating human activities and natural systems for experiencing, exploring and discovering without ignoring its history. Taichung Gateway Park becomes the bridge for connecting the disconnected systems by providing flow movement. It is a new vision for bringing the nature to the city, history to future, and ground to sky. RETENTION POND is a constructed stormwater pond that is consistently wet and retains water for biological treatment. The retention pond creates more volume for stormwater runoff and mitigates the flooding issue from the existing canal with a 5,800 acre catchment area. The design of the retention pond can achieve a holding water volume for 25-year stormwater event. DETENTION POND is a stormwater basin design to intercept stormwater runoff and metered discharge to a conveyance system. The design of the detention ponds prevent the overflow from the retention pond during the storm event, and reduced stormwater load from the conveyance system; also keeps water capacity in the park. GREEN STREETS create streets with green medians that also deliver water treatment services. The design cooperates with new neighborhoods with three different types of green streets to convey water runoff from the streets to the park. Moreover, the greens streets provide the connection from the streets to the park; they not only provide the connection for people and water, but also create pedestrian safety and friendly for neighborhoods. A RETENTION POND is not just designed for stormwater management, but also serves as an amenity for multiple activities such as boating, sailing and fishing. Furthermore, when properly maintained it has a great opportunity to provide an aquatic habitat for the park. The design seeks to draw the aquatic life from the Fatsu River, which is the main stream from the existing canal. By providing a wet pond, it can function for both human activities and the restoration of a diminishing habitat. THE RETENTION POND helps to remove pollutants from the first flash of a storm event through biological uptake and sedimentation. The design of the retention pond can hold a water volume of 280,000 m3 from the existing canal, which has a flooding issue. The parkâ&#x20AC;&#x2122;s stormwater management system includes a safety zone where water cannot flood. If stormwater exceeds the volume that the retention pond can hold, additional stormwater features in the park mitigate the overflow. RAINWATER HARVESTING is one of the solutions for keeping water capacity in the park. Using planting areas for rainwater collection and planting to help runoff infiltrate, they are additional water storage basins underneath the planting areas collect rainwater. After a filtration and disinfection processes, the reclaimed water can be used to flush toilets and irrigate gardens. DURING A STORM EVENT, water runs to the collection areas and emergency spillways that are designed for connecting stormwater systems throughout park. THE DETENTION PONDS are designed to prevent the overflow of the retention pond during a storm event. The detention ponds function not only as a stormwater management feature, but also as an amenity for people. They are a series of open spaces programmed for multiple activities including golf practice hills, soccer field, and picnic areas. The stormwater features in the park can achieve the water volume capacity of a 25-year storm event. HEAVY METAL POLLUTION is present underneath the flight hangar. For untreatable substances (chromium, aluminum, copper and lead), the design uses landfill to cap the contamination and rain gardens around the contaminated area to prevent exposure to heavy metal contamination. For the treatable substance (cadmium), the planting design includes plants that can remove cadmium from the contaminated soil. The phytoremediation process requires a decade to remove heavy metal substances from the site. TO PREVENT HEAVY METAL SUBSTANCES from exposed during a storm event, the design uses rain gardens to prevent exposure. Rain gardens also help to mitigate stormwater pollution through a phytoremediation process as water runs through the plants and soil community. THE DETENTION POND, designed with native and adapted plants, attracts wildlife creating a viable habitat. DURING A STORM EVENT, the plants around the detention pond further absorb the fertilizers used in the garden and clean the water before it drains to the pond. The detention pond connects with other stormwater feature in the site and meters discharged stormwater to a conveyance system. THE PARK DESIGNS AS A MEDIA that prevent the overflow for the city sewage system, and stormwater would slowly discharge to the existing canal, which has small catmint area in southern side of the park. The park stormwater conveyance system connected to the retention pond in the south side of the park, and the water will slowly discharge back to the city infrastructure. The design uses the water feature to remind people that the park is not just provide for recreation, but also as function for stormwater management. IN ORDER TO ACHIEVE SUSTAINABILITY, the design includes a soil management plan to balance the cut and fill during the construction. The soil excavated by creating the stormwater features can be used as landfill to cap the contaminated soil and created landforms in the park. Using landforms creates high and low viewing experiences for users and goes with different layers of vegetation. THE FORMER FLIGHT HANGAR is the only historical structure that remains in the Master Plan with significant historical meaning to the site. The design preserves and protects the flight hangar turning it into the Air & Space Museum and Airplane Plaza. This is where people can see the history and learn the stories behind the site before it opened to the public. As the runway is one of the most important elements for the Taichung former airport, the runway redesign idea maintains the onsite structure, but also will open up for certain degrees with planting design. The reused runway not only maintains the history of the site, but also turns it into a new and vivid greenway by providing activities and planting. Murraya paniculata Hydrangea macrophylla Hypericum monogynum L.
VEGETATION FLOW CORRIDOR CONNECTIONS AND SEASONAL TREES The corridor planting design not only creates more greenery, but also uses the colors of the trees to create distinct identities for each corridor. The planting design includes trees that are native or adapted to the area and provides the foundation for the overall planting palette. The corridor planting design is based on the color and seasonal changes of the trees and assigns different colors and species for each corridor. Each corridor has its own character and connects with surrounding districts. When people walk on the corridors, they can identify where they are going with colors and species of the trees. realized that design is meaningful and interesting. From that time I devoted myself to our department courses, and cultivated a greater understanding of landscape design and urban planning. In the last year of college, I received an internship at my teacherâ&#x20AC;&#x2122;s firm. During my internship, I received many opportunities on real projects to utilize what I have learned in school. The project that made the biggest impression on me was a small plaza called ChinShin plaza. It was a small abandoned space between two tall buildings. After construction was done, it became a wonderful small space for public use. I was so surprised that one small space can change the surrounding area into a popular urban outdoor area. I was so proud that I was one of the people who helped to build a green space in the city. After the internship, I felt that I needed to learn more than just the big picture of urban planning. I wanted to focus on the details of landscape architecture. That is the reason that I came to San Francisco to attend the School of Landscape Architecture in Academy of Art University . I am a landscape designer with enthusiasm to discovering urban context and transform potential places into sustainable landscape. As a designer, I believe design is not only creating a place for function and aesthetics, but also serving as a connector between people and environment. With my passion of creative design, I am eager to embark on my professional career and dedicate my expertise into high quality design, and learning from your experienced practice to continuing my professional development. Certainly, I will devote my design expertise to the office and add the company’s value.